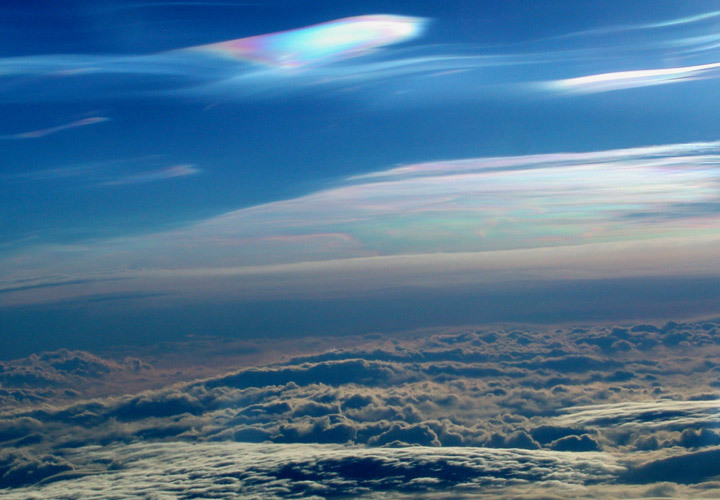 The colorful clouds near the top of this picture are Polar Stratospheric Clouds (PSCs). The PSCs are flying high above the darker cirrus clouds at the bottom of the picture. Image courtesy of NASA (Paul Newman, GSFC). Nacreous clouds are wave clouds. They are often found downwind of mountain ranges which induce gravity waves in the lower stratosphere. Their sheet-like forms slowly undulate and stretch as the waves evolve. 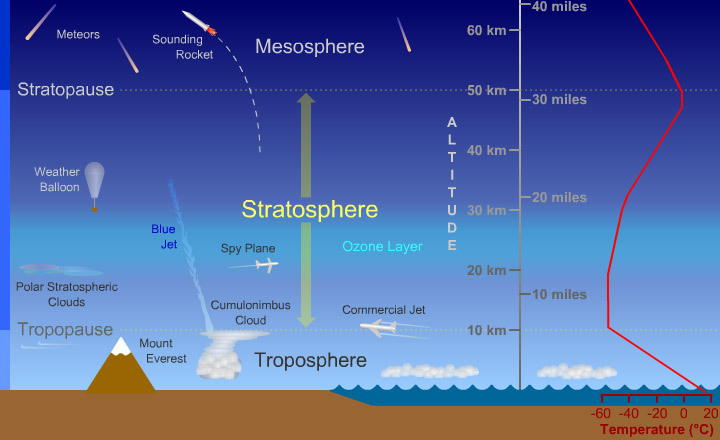 The clouds can also be associated with very high surface winds which may indicate the presence of, or induce, winds and waves in the stratosphere. They form at temperatures of around minus 85ºC, colder than average lower stratophere temperatures, and are comprised of ice particles ~10µm across. The clouds must be composed of similar sized crystals to produce the characteristic bright iridescent colors by diffraction and interference. 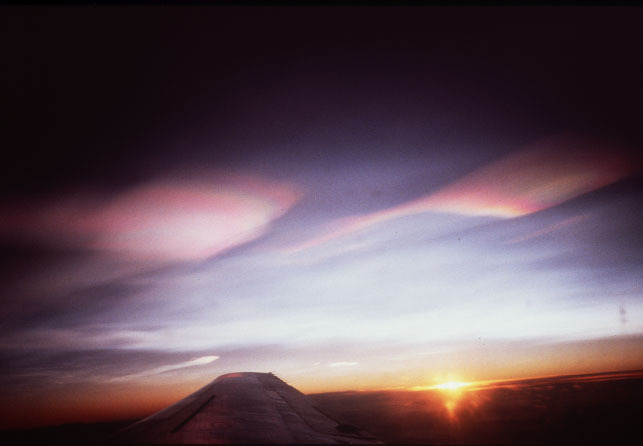 Polar stratospheric clouds or PSCs, also known as nacreous clouds from nacre, or mother of pearl, due to its iridescence), are clouds in the winter polar stratosphere. PSCs form at very high altitudes, between 15 and 25 km (about 50,000 to 80,000 feet). PSCs only form at very cold temperatures around -78° C (-108° F). Sometimes, in winter near the North or South Pole, temperatures in the lower stratosphere get that cold. That's when PSCs can form. 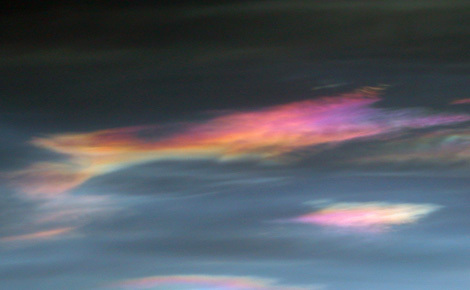 Nacreous clouds composed of ice crystals with temperatures of ~minus 85ºC. Less spectacular than nacreous clouds, more diffuse and less bright colours. Sometimes nacreous clouds are embedded in them. Type I clouds are slightly warmer (~ minus 78ºC) than Type II and are composed of exotic solids or liquid droplets. Small spherical droplets of a solution of nitric and sulphuric acids. PSCs were long regarded as curiosities and of no real consequence. However, Type I clouds are now known as sites of harmful destruction of stratospheric ozone over the Antarctic and Arctic. Their surfaces act as catalysts which convert more benign forms of man-made chlorine into active free radicals (for example ClO, chlorine monoxide). During the return of Spring sunlight these radicals destroy many ozone molecules in a series of chain reactions. Cloud formation is doubly harmful because it also removes gaseous nitric acid from the stratosphere which would otherwise combine with ClO to form less reactive forms of chlorine.